Recently I have been looking at the work of Erte.Not only was he a fantastic illustrator but he was a costume designer too.Looking at his pictures has inspired me to design this necklace. 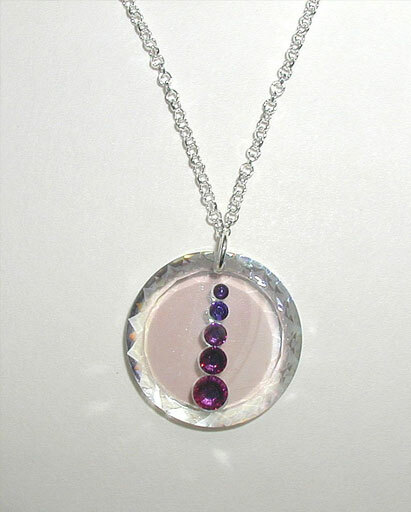 Hanging from a 16" sterling silver chain is a 2cm Swarovski pendant.One side of the pendant has a slight sheen to it giving a perfect backdrop to a run of graduated Swarovski rhinestones. 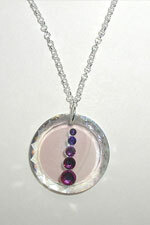 This piece is so versatile.It can add simple glamour to a day outfit and sparkle in the evening too. This pendant has a run of rhinestones which mainly show purple but as the pendant moves they show what I can only describe as peacock colours,greens and golds. I have also made this necklace using red rhinestones.Please contact me for a picture.Other colours can be made,please contact me at least a week in advance.